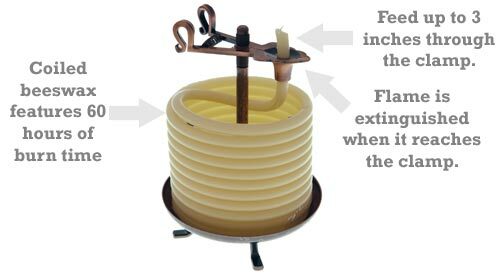 Beeswax rope candle automatically extinguishes itself. Candle by the Hour is a coiled, beeswax rope candle that features the ability to automatically extinguish itself. 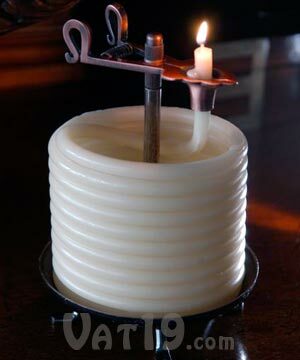 Simply feed up to three inches of flexible, pliable candle (about an hour's worth of burn time) through the brass clamp. When the flame reaches the clamp, it will extinguish. No worries of burning down the house. Yay! "Rope" has a diameter of 3/8"
Candle by the Hour uses coiled, pliable beeswax to create an auto-extinguishing rope candle. Each inch of candle burns for approximately 20 minutes. You can feed up to 3 inches through the clamp for a worry-free burn time of one hour. The Candle by the Hour features a brass stand and clamp. The beeswax rope candle is unscented with a 100% cotton, lead-free wick. Candle by the Hour features the ability to prevent your house from burning down. That is unless you knock your new rope candle over into the pile of dry leaves sitting underneath your curtains. Why is that there, anyway? Yes, Candle by the Hour refills are available! Once you've burned through your sixty hours of rope candle, you can buy coiled refills. It's like we're both the car dealer and the gas station. Brilliant! Please note that the Candle by the Hour refills also have a 60 hour burn time. Purchase 60 hour coil refills for your Candle by the Hour so you'll never run out!